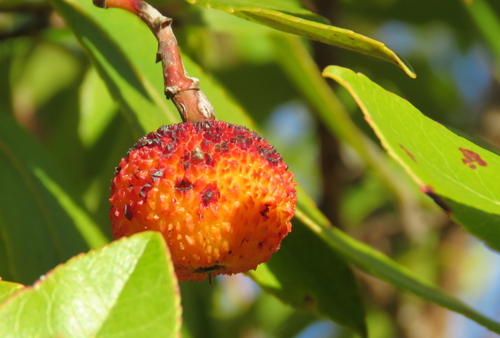 This Autumn Strawberry Tree fruits have been collected and planted in the wildlife reserve. It is hoped that a number of Strawberry Trees will grow as a result. This species typically grows in areas that are favoured by Iberian Lynx. The trees are also a good food tree for lots of wildlife that eat the fruits such as Thrushes, Wild Boar and Iberian Badgers. 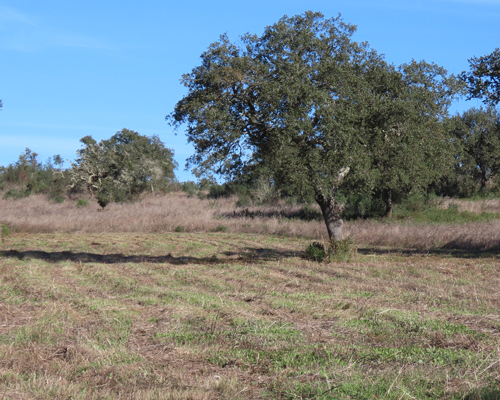 Cork Oak Acorns have also been planted in the wildlife reserve. 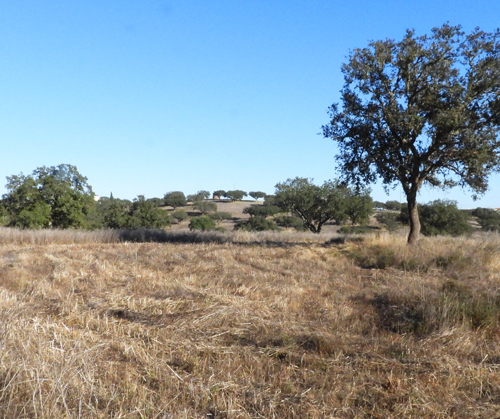 This is another key species common in areas favoured by Iberian Lynx. 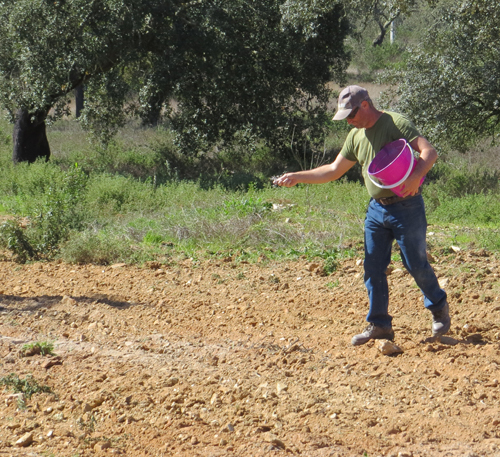 Iberian Holm Oak Acorns have also been planted to encourage new trees to grow. In particular they are needed to replace dead and dying Iberian Holm Oaks that have likely been attacked by pathogenic fungi or bacteria. It is planned to also plant some Olive seeds. 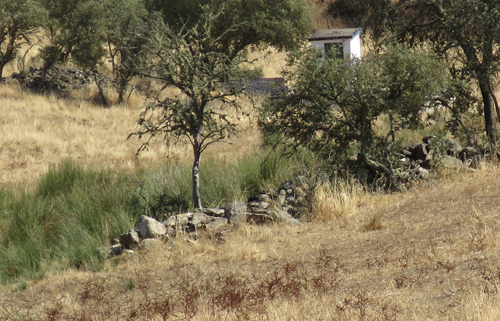 Olive trees are the fourth key tree species in areas favoured by Iberian Lynx. 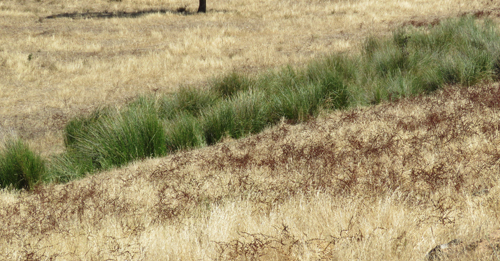 Picture showing selective Mowing of Meadows. The area on the left has just been mown (December) and the area on the right is unmown. This is the first year we have introduced Meadow Mowing. 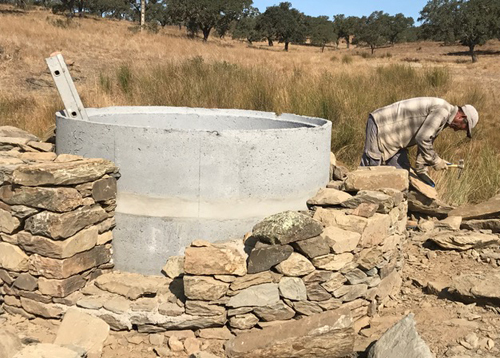 This is designed to act as a replacement for the lack of cattle and sheep on the land which have overgrazed the area in the past. It is hoped that the Mown areas will have a good show of flowers in the Spring. 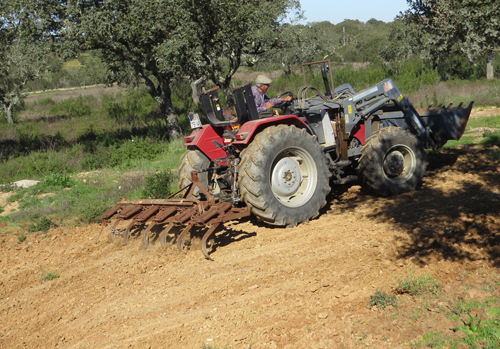 Grillo Mowing machine. This will be a great help to encourage flowers and insects in the meadows. 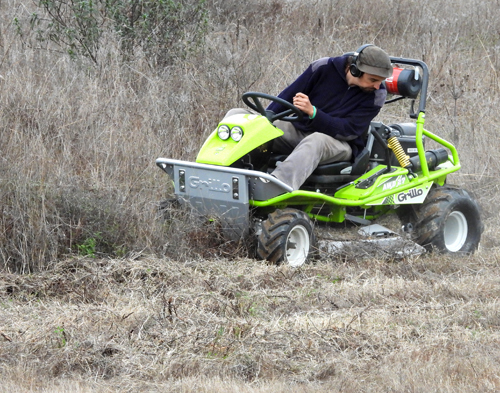 The Grillo Mower is a versatile machine that will help us keep a mixture of Mown and Unmown areas in the wildlife reserve. 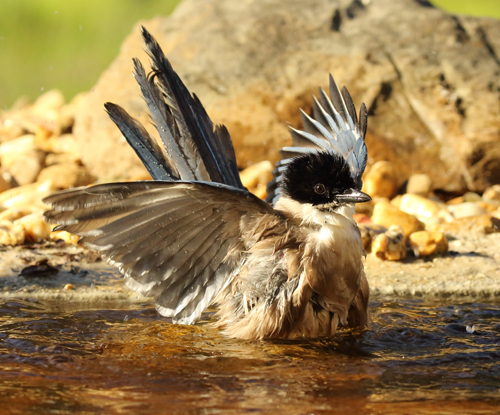 The aim of this is to maximise the available habitats for different species. Freshly Mown Meadow (November). With the good Autumn rains this area will soon green up. Mown Meadow alongside one of the reserve's access tracks (on the left). Gum Cistus (Cistus ladanifer) (Estevas) can grow to 2.5m tall and often will die when they reach this height, leaving an area with insufficient light for other plants to grow. 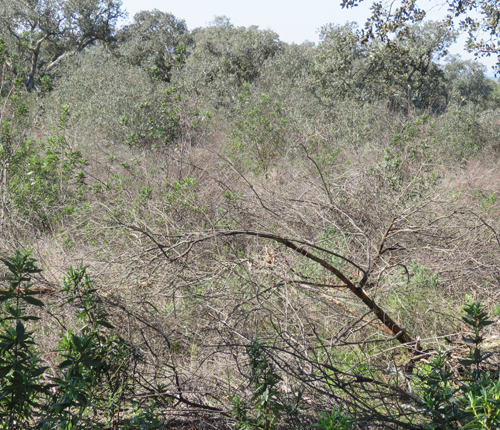 Parts of the reserve have not been managed for mny years and there are a few large patches of Gum Cistus scrub. 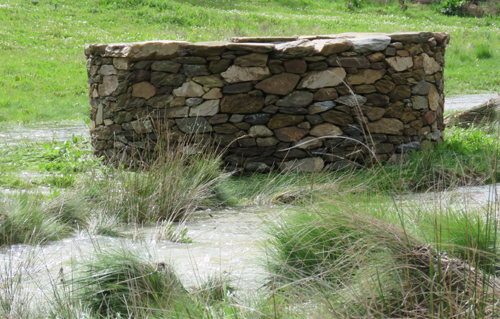 When the normally rock-hard ground is wet, old Gum Cistus plants can be pulled up. Once they have dried out a little they will be removed . This area will in due course be rejuvenated with new plant growth of a wide variety of species. Some areas with vigorous green Cistus growth have been left. 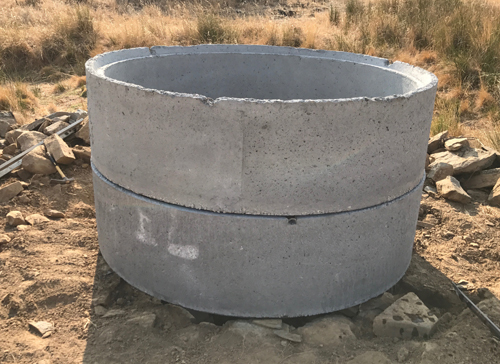 This will provide cover for rabbits and other animals. Our management system attempts to make habitat imrpovements by doing things in moderation. 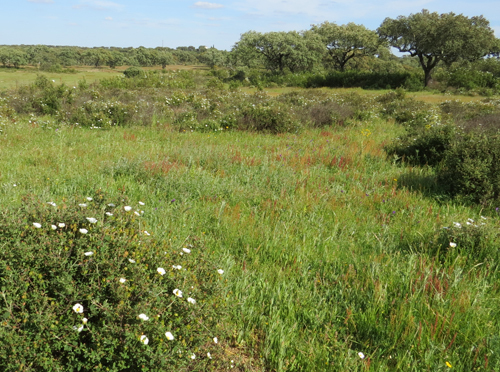 The opening up of areas long smothered by the vigorous Cistus growth will be monitored to see what plant species re-appear. 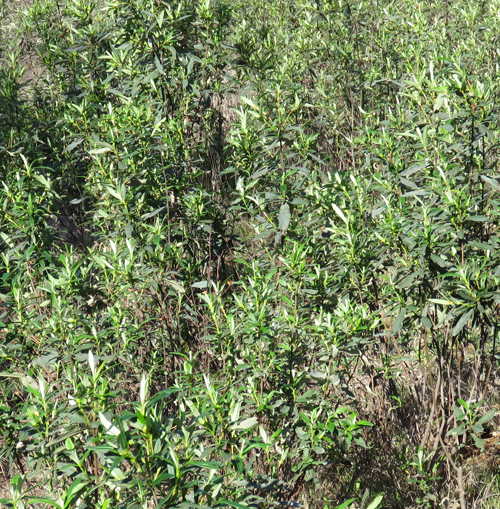 Unlike many farms in the area on our nature reserve we will always keep some parts with plenty of Gum Cistus. It is a local plant and has a role to play. But at the moment some of the old growth needs thinning out. 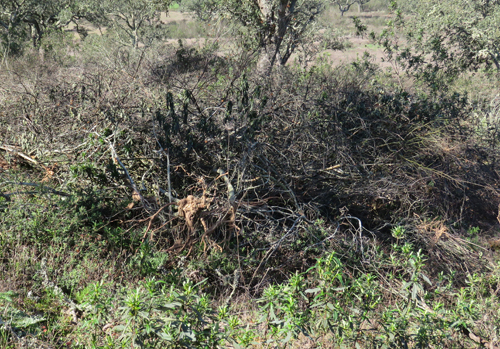 Old and dying Cistus plants (Gum Cistus, Cerispus Rockrose and other species) has been cleared from this area to reduce the fire hazard (rock roses are highly flammable) and to re-invigorate the herbs and flowers that have been shadowed by the Cistus. 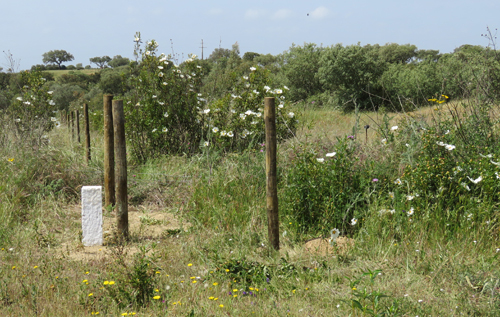 Some greener Cistus plants have been left in situ to provide nesting areas for a variety of birds that utilise these scrub areas such as Zitting Cisticolas and Sardinian Warblers. 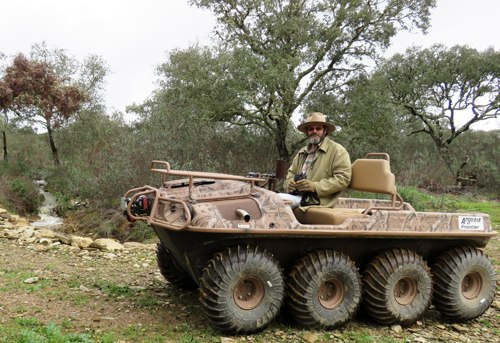 Treading Lightly: The 8 wheel drive Argocat has one of the lightest footprints of all SUVs/ATVs. 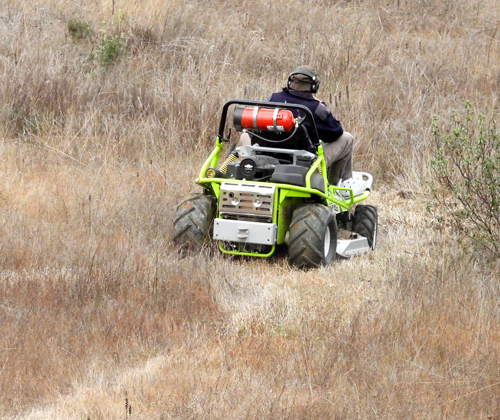 It does not tear up the land and is an extremely useful management tool on the reserve. We use regular roadways so as not to damage the meadows. In extreme conditions it can also be driven in water, being fully amphibious. 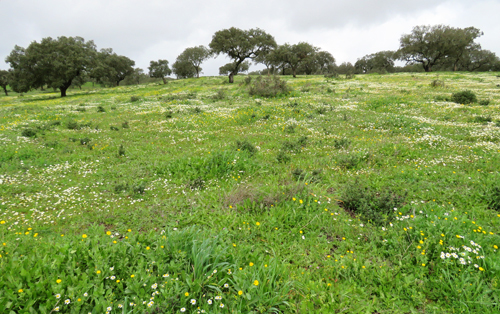 Meadow with Dusky Dogfennel and Field Marigolds in March 2018 and Iberian Holm Oaks in the background. River in spate, March 2018. 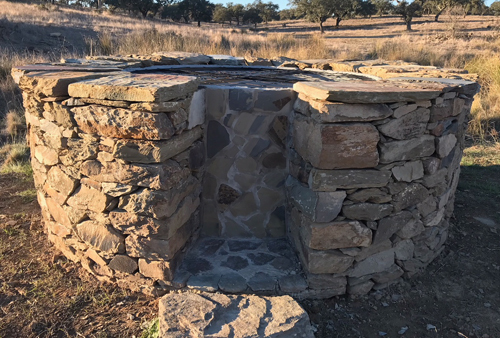 ......... to this magnificent new Well ! Well surrounded by river in spate. Note on Water Resources: Windmill Pond has an area of around 3,000 sq m. And the average depth is perhaps 1.5m. So the volume of water is approximately 4,500 cubic metres which equates to 4.5 million litres. Beef cattle drink maybe 70 litres per day in Summer and perhaps 40 litres per day at other times. So a herd of 50 beef cattle can drink around 1.2 million litres of water in a year which is roughly speaking one quarter of all the water in Windmill Pond. So by keeping the nature reserve free of grazing livestock for the time being the annual life expectancy of Windmill Pond's water is considerably increased. It will be interesting to see whether the pond gets completely dry at the end of 2018 as it did in 2017. Or whether it will still retain some water after another expected long, hot summer. 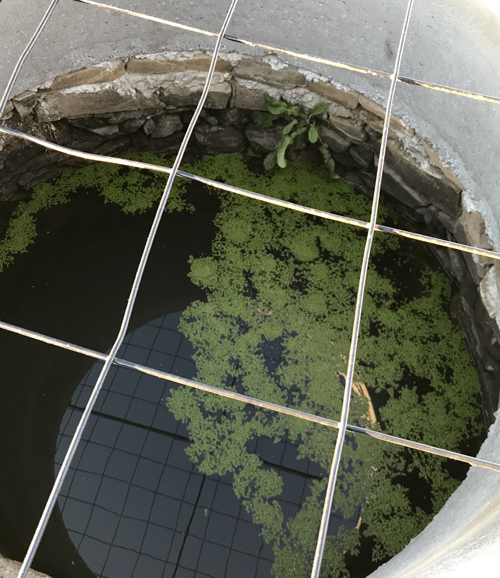 In 2017 the pond was completely dry by September 29th. 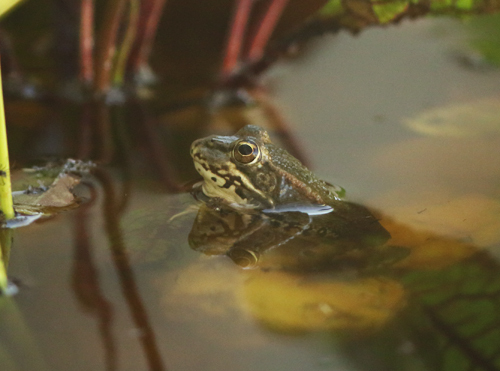 But we are hoping that in 2018 the pond will be a vital resource for wildlife for the whole year. Time will tell. 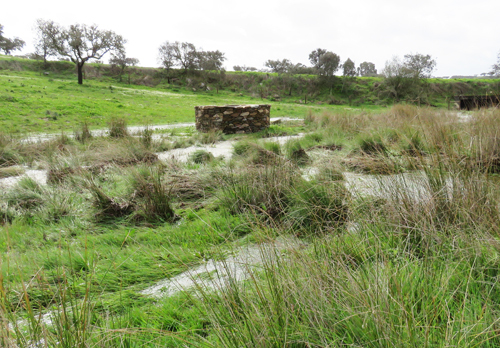 The new piece of land incorporated into the nature reserve in June 2017 includes a river and a large pond, Windmill Pond. 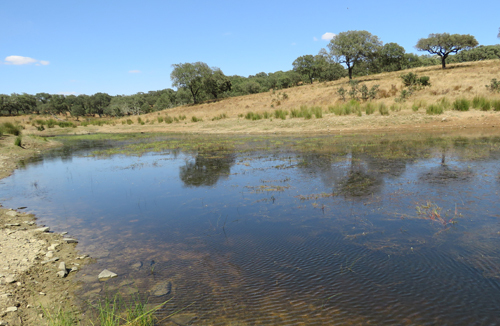 The pond measures around 114m by 42m and is around 3,000 sq m in extent. It is fedpartly by a natural underground Spring and a river that flows in the Winter/Spring. This extra habitat now means that a variety of water birds are found on the reserve, such as little grebes and ducks (mallard). In 2017 the nature reserve was increased in size from 12 Hectares to 40 Hectares. This is a 331% increase in land area. In 2017 the nature reserve has been designated as a non-hunting area. 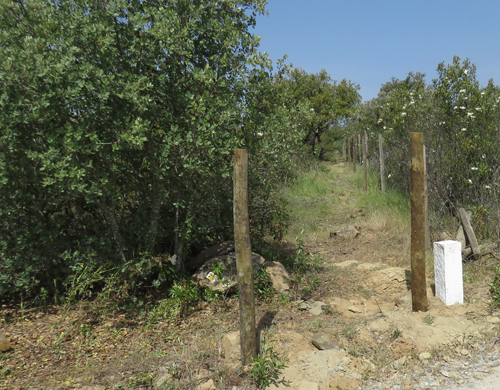 Giving additional protection to the birds and mammals living on the nature reserve. The whole nature reserve is fenced to keep out livestock. 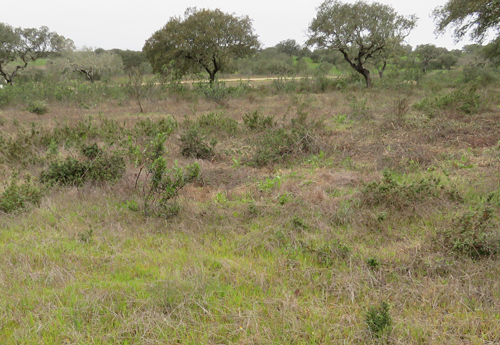 This will reduce tick-infestations and make sure that the vegetation has an opportunity to recover from past overgrazing. The land management policy we are following is to undertake relatively 'soft' land management practises. 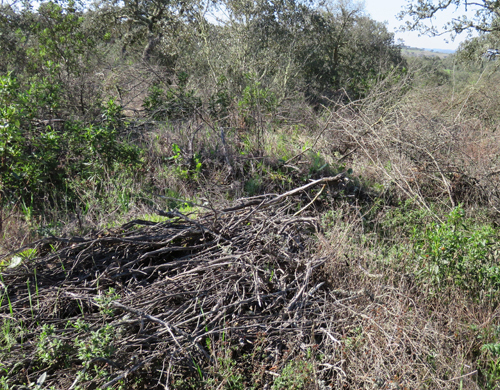 This means that we will carry out a certain amount of scrub control to keep the extremely vigorous Gum Cistus (Cistus ladanifer) (Esteva) in check. But always ensuring that there is sufficient scrub left to provide cover for rabbits, nightingales and various ground nesting birds such as Woodlarks and Corn Buntings. 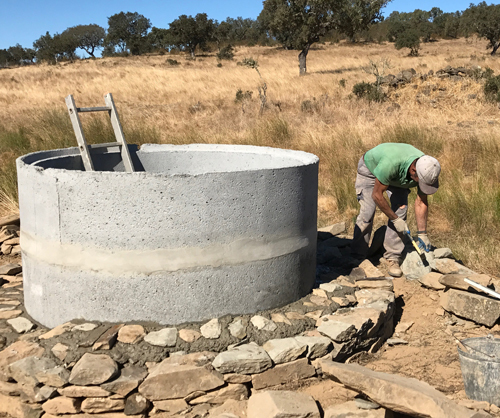 We will also carry out a certain amount of tree planting, but only with native trees that are found in this part of Alentejo. 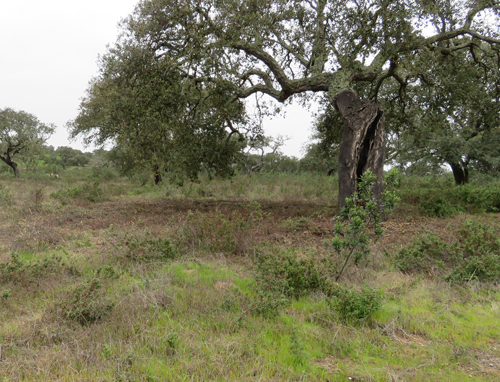 Key species will be Cork Oak (Quercus suber) (Sobreiro) and Strawberry tree (Arbutus unedo) (Medronheiro). 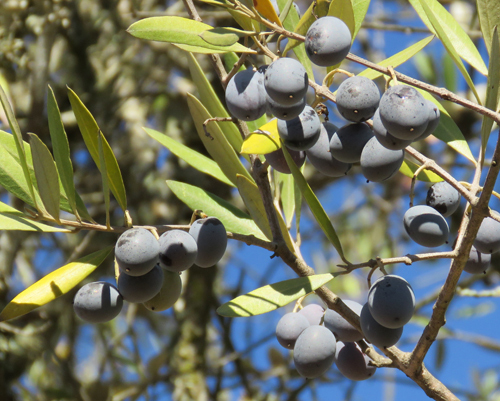 And also Olives (Olea europaea) (Oliveira) and Iberian Pears (Pyrus bourgaeana) (Pereira brava). 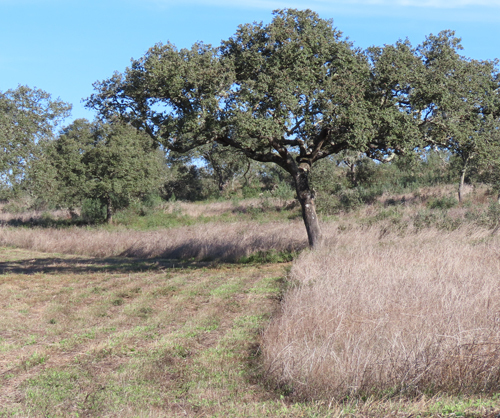 The wildlife reserve is already well populated with Iberian Holm Oaks (Quercus rotundifolia) (Azinheira). 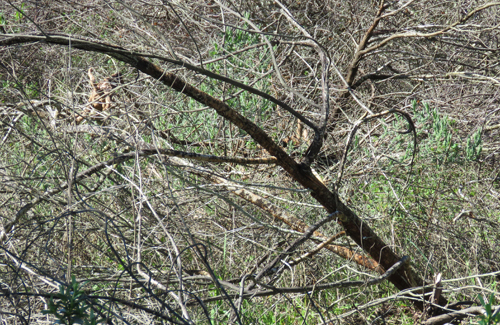 Together these three tree species form an ecosystem or habitat-type known as Montado. 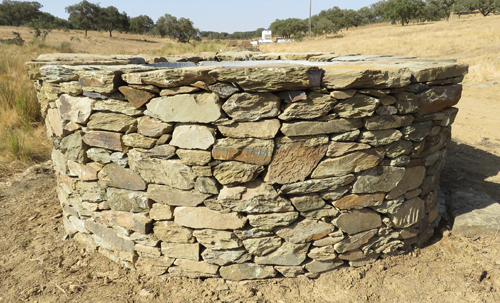 Montado is very similar to the Spanish "dehesa" and is a semi-natural habitat, since it was created by agricultural activities, namely cork and livestock production. 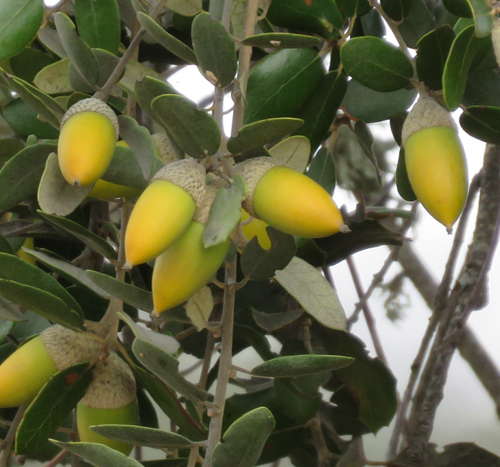 Cork trees provide both cork and acorns that are fed on by free-range pigs. 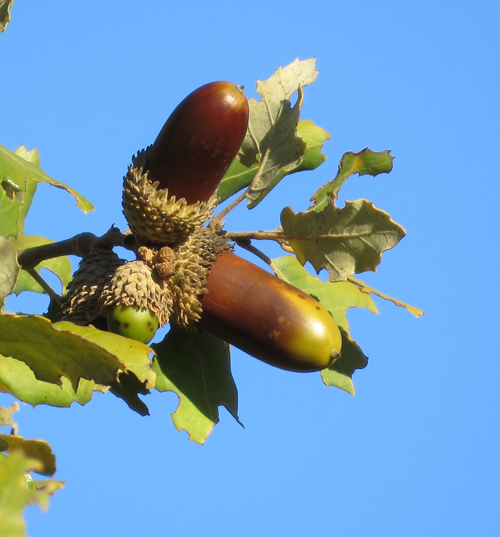 These animals also forage onIberian Holm Oak acorns. Ecologically speaking Montado is a very rich habitat that has many similarities to African Savanna and also to the Asian Steppes. 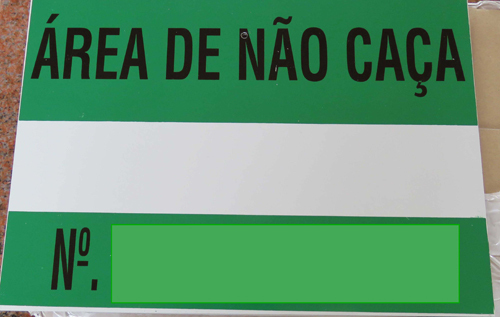 In Portugal Montado is home to a large number of rare species. Most notably the Iberian Lynx (Lynx pardinus) (Lince-ibérico), the rarest species of cat in the world. 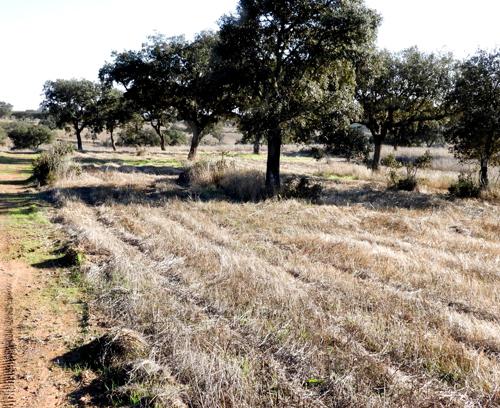 Iberian lynx historically lived in Alentejo in the area where our wildlife reserve is situated. So our management plan also aims to make conditions suitable for Iberian lynxes to live on the reserve should they choose to do so in the future. Montado is also home to a large number of rare bird species. In the past our land has been used for livestock grazing, especially sheep. However at the moment we feel that some overgrazing may have occurred and so our current policy is to exclude domestic livestock from the reserve. 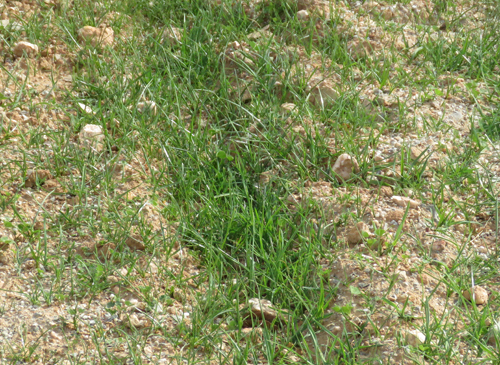 The soils here are very poor being rocky, sandy and with hard clay. So many flower species growing here are those more normally associated with sandy coastal areas. Many others are typical of overgrazed agricultural land. Hopefully our management will allow a larger mixture of flower species to flourish. 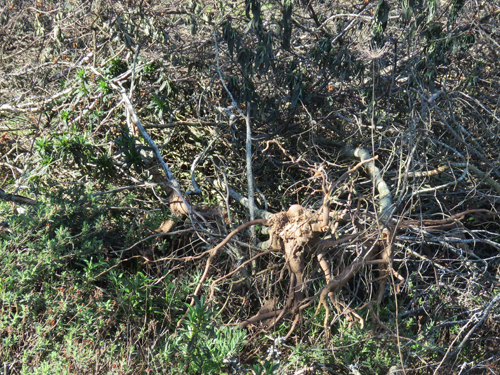 Any invasive alien plant species are removed such as blue gums (eucalyptus), pampas grass and Agaves. We now have a licence for the central part of our nature reserve to erect more explicit 'No Hunting' signs. These will be put up before the hunting season starts in mid August (ends at end of February). The land added to the nature reserve in June 2017 has a large pond which is home to grebes, ducks, turtles, amphibians and damselflies among other animals. The River on the new piece of land flows into the large pond (which is behind a dam wall) and then flows out the other side. 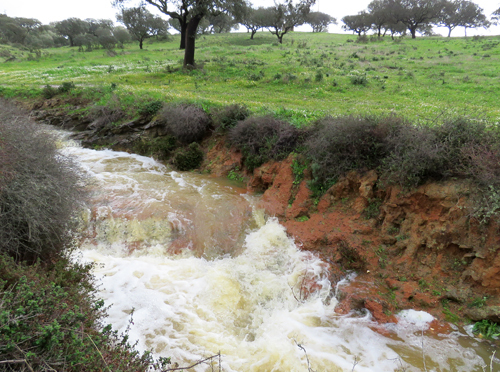 It is eventually joined by the winterbourne stream on our original property. 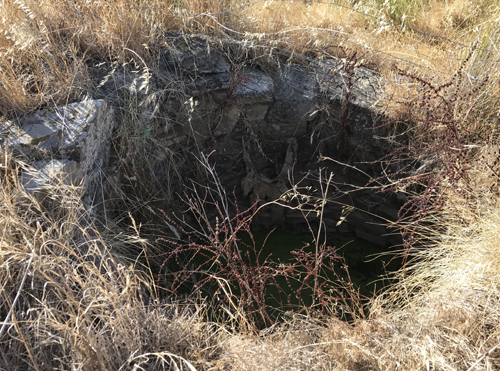 The underground water near the river provides water for a small neighouring village via a pump next to our river. No Hunting Signs have now been put up all around the nature reserve's boundary fence. 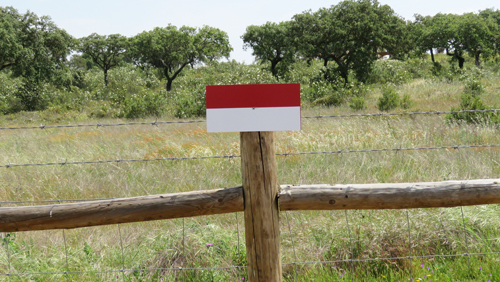 Birds and mammals living on the nature reserve will now have a secure haven away from local hunters. 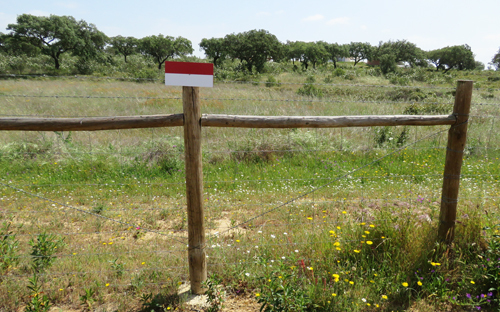 Fencing being put up to keep livestock off the new plot containing Olive trees and Cork Oaks. 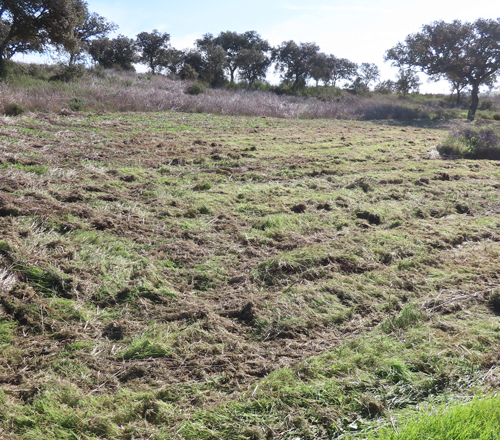 The Olive grove plot has not been managed for some years and there is a need to remove some of the vigorous Gum Cistus which otherwise overwhelms some of the trees and grassland. 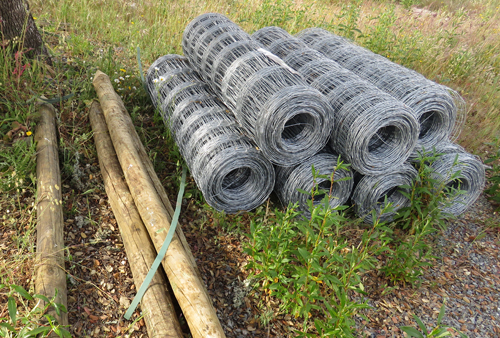 Fencing materials to be recycled where possible. This fencing was taken down when a new piece of land was incorporated into the nature reserve and the fencelined was moved further out. 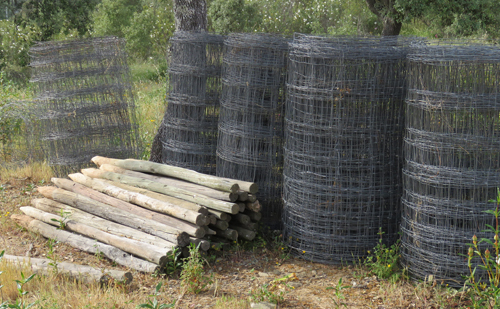 New Fencing materials to keep livestock out of land newly added to the nature reserve. 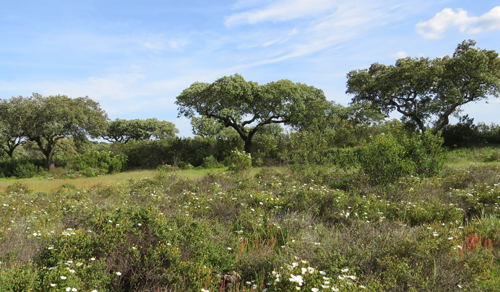 Iberian Holm Oaks and Gum Cistus scrub on new area of land recently added to the nature reserve. We will undertake some scub management on this new piece of land. Partly with the aim of creating a larger meadow to act as a hunting ground for Common Kestrels. We will be erecting a Kestrel nest-box with a solar-powered wifi video camera and hope that our local Kestrels will choose to nest in it in the next breeding season. 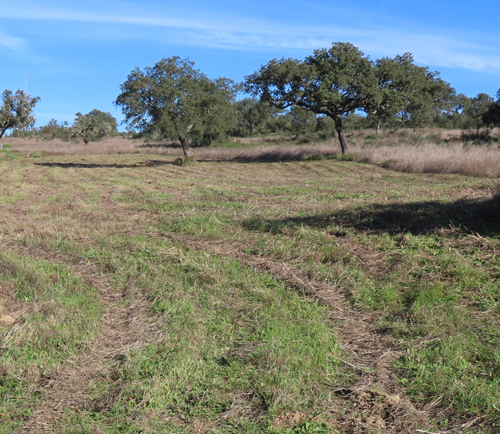 Land damaged by machinery has now been lightly tilled and re-seeded with grasses and wildflowers. The re-seeded area should recover in a year or two. 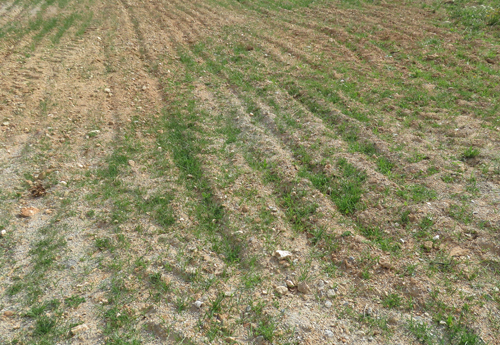 The damaged land was gently tilled before being re-seeded so that the land was not further compacted. Re-seeding with grass and wildflower seeds. 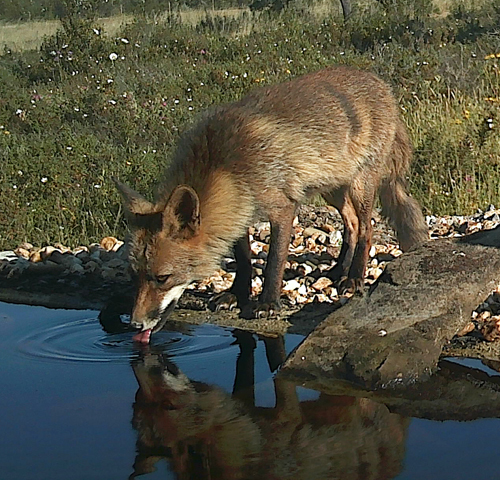 Provision of a drinking pond has proved to be very popular with a range of animals including this Iberian Fox. Also this Iberian Painted Frog. 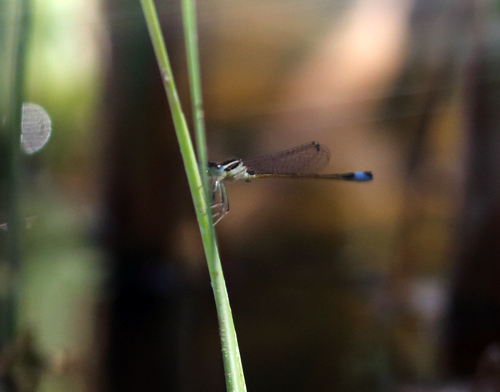 And an Iberian Bluetail - a species of Damselfy. And lots of Iberian Azurewinged Magpies.